Demul is the emulator that we’ve had best results with here at VirtualDreamcast.com. Downloading and configuring it can seem daunting if you’ve never played with an emulator before, but follow the steps here and you’ll be playing Dreamcast games before you know it. First of all, we need to download the emulator. You can do that by visiting this page. Sadly it seems like the emulator hasn’t been updated since 2013, but it still works well so don’t concern yourself with that. The emulator downloads as a .rar file. You will need to extract the files from this archive to any convenient location on your PC. Rar files are similar to Zip files, but Windows does not support them without extra software. If you’re not familiar with dealing with .rar files, we recommend you follow these simple tutorials for 7-zip, a free tool that can open .rar files. Once you’ve managed to extract the files, the next step is to copy your Demul compatible Dreamcast BIOS images. Unfortunately these files are under copyright so we can’t link to them directly, but the file you need is called “dc.zip” and it should contain the following files. If you’re familiar with file hashing tools, you can check that the files are the correct ones by comparing the MD5 hash numbers we’ve provided too. If you need an introduction to file hashes and how to compare them, there’s a beginners guide here. Once you have obtained these files, create a sub-folder called “roms” and copy the zip file into there. You don’t need to extract the files from the zip archive. With that step complete, you can start the emulator for the first time. When you do this, an error message will appear saying that BIOS & Plugins are not configured. The emulator will take you directly to the configuration window, so lets look at that now. Click on the picture below if you need to enlarge it. Most of the options can be left as the defaults, but we’ll go through them all now just for the sake of completeness. Video Plugin – You have two choices here, gpuDX10 and gpuDX11. As you might have guessed, gpuDX10 will work on DirectX 10 graphics hardware, while gpuDX11 will only work on hardware that is DirectX 11 capable. DirectX 11 mode works better in some games, but can be more demanding on hardware and is not supported by all graphics cards. It is probably worth selecting if your PC can handle it. 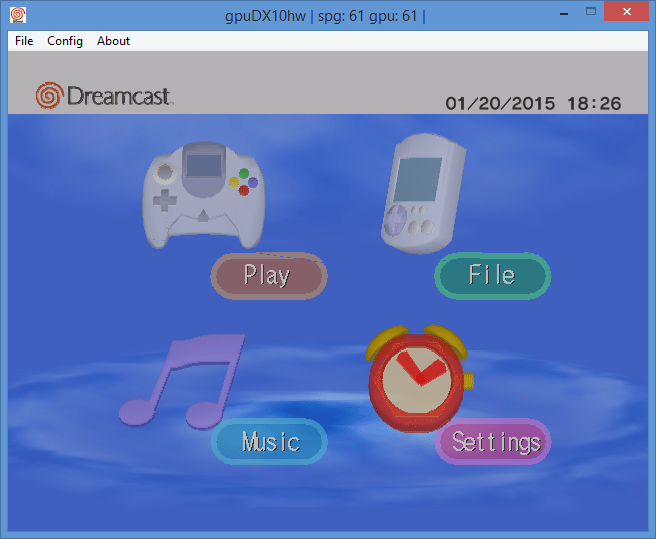 GD-ROM Plugin – This is the plugin that emulates the Dreamcast’s disc drive. You have three choices, gdrCHD, gdrDemul and gdrImage. Typically you will use gdrImage. GdrImage is compatible both with Discjuggler CD image (typically these have a .cdi file extension) and 1:1 dumps of a Dreamcast GD-ROMs (typically these come in .gdi format with several other .bin or .raw files). GdrDemul can use a real optical drive. Although real Dreamcast games aren’t compatible with regular PC DVD drives, a large number of homebrew and pirate Dreamcast titles were distributed on CD and CD-R discs. Finally, gdrCHD is compatible with the CHD format used by the MAME arcade emulator. Multi threaded GD-ROM mode (need restart) – Generally this isn’t needed. Controls plugin – Only one option available here, so no need to change anything. Sound plugin – Again only one option available here, so no need to change anything. Netplay – As we explained in our What is a Dreamcast? article, the Dreamcast supported online gaming via dial-up modems and LAN adapters. With this option you can emulate this functionality. For this to work you also need the OpenVPN software for Windows. We may cover Netplay in a later article, but for now, leave this option disabled. Plugins Path, Roms and Bioses Paths and Nvram Path – These options should automatically configure themselves to point to a sub-directory within your Demul folder. If the folders don’t exist already, Demul will create them. The “Roms and Bioses” Paths should already exist as we created that earlier in the tutorial. Click on “OK” now and the configuration window will close, leaving you with just the Demul window shown below. At this point we can see if basic emulation is working. Click on the “File” menu and choose “Run Dreamcast”. Several windows will now pop up telling you that things aren’t configured. We want to use the default configuration on everything for now, so simply keep clicking “OK” (not Cancel) on each notification window and configuration window that then appears, without changing any settings just yet. Finally, if everything is working correctly, you should see the following window. This is the screen you see when you power on a real Dreamcast console with no game disc in the drive. Congratulations getting this far! You won’t be able to do anything yet though, since we need to configure controllers. Click on the “File” menu and choose “Stop”. You can now proceed to the next part of the tutorial where we configure the emulators plugins. I’m not sure which images i’m coping and from where. where would i locate these bios images? lets just say i’m not familiar with file hashing. this part is kinda unclear to me. “Once you’ve managed to extract the files, the next step is to copy your Demul compatible Dreamcast BIOS images. Unfortunately these files are under copyright so we can’t link to them directly, but the file you need is called “dc.zip” and it should contain the following files. If you’re familiar with file hashing tools, you can check that the files are the correct ones by comparing the MD5 hash numbers we’ve provided too. So I managed to follow you all the way to “Run Dreamcast” and as soon as I click that I get “unable to find ‘mpr-21931.ic501’ in romset ‘dc'”. Is my dc zip incorrect? Seems likely :( Have you checked the hash values on your ROM set? I’m getting the same error and I checked that my ROM hashes match. Same and dev doesn’t seem interested in helping/still hasn’t replied. I have exactly the same issue. Has anybody know why is this happening? In case someone else comes here with the same issue… you may have done what i did… make sure you don’t unzip the dc.zip file. Place it in your rom directory zipped. Thank you. You are a god send. The only other fix I saw for this was a video from someone whose first language wasn’t English and I guessed used google translate. It was borderline unreadable. in the roms(not created by default) folder you need the bios files in “dc.zip”. also unlike nulldc where you use just dc_boot.bin and dc_flash.bin the zip file needs 1_01d_01.bin,1_01d_02.bin,1_004_01.bin, and/or 1_011_01.bin inside it. I am using the gdrImage GD-ROM plug-in, and cannot load a .cdi file. It keeps telling me to insert a disc when I select Play. I am trying to play Rayman 2, and I unpacked the image to the correct path “whatever/roms), but each time I pick the file on launch, it just goes to that blue screen with with controller floating there, taunting me. I’ve tried several combinations, and nothing gets the game to load. What’s going on? Do you know that the Rayman game you’re trying to play is definitely a good image? I downloaded two different Rayman 2 dumps. One was zipped into several files, and had to be extracted, and the other was just one file. They are both .cdi images, and both appear to be the same file size. They jut won’t play though. I even tried playing them via showing all file types with the other GD-ROM plug-ins, but I didn’t really think that would work (and it didn’t). I’m going to try with another game. Thanks for the reply. Try using a dump that comes in a .GDI file, not .CDI. .GDI files are true dumps of Dreamcast games that were dumped directly from the real disc, and .CDI files are dumps that were shrinked in size by pirates to fit on a CD-R to play on a Dreamcast for the lowest price possible. I’m having a UNFORGIVABLE issue with the audio in my Demul. I hear “BEdlEUghEUHUH, BEdlEUghEUHUH, BEdlEUghEUHUH”. The audio seems to have.. like.. varying pitch? It’s EXTREMELY irritating. This emulator is a piece of s**t! Every time I try to boot the sucker up, it keeps giving me a BIOS error and I did everything possible to get it to work. It’s as if the person who created it purposefully made the emulator unplayable as some kind of sick joke. And even if you do have the right BIOS, it’s never going to work. You’re better off just getting the real thing. Works for us I promise! Did you check the MD5 hash on your BIOS rom?